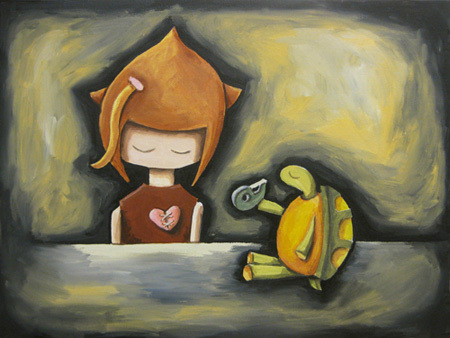 fabric8 is pleased to present Good Intentions, a solo show of small, affordable works by artist Ninjagrl. Good Intentions chronicles the sometimes biographical, sometimes imaginary explorations of Ninjagrl, her BFF Turtle, and their various marine animal friends. Ever adventurous, they mean well and try to do good, but somehow trouble often seems to find them. Seattle-based artist Ninjagrl has an extensive crayon collection and a cat named Turtle. Before turning ninja, she moonlighted as an architect and 3D modeler in Minneapolis and Chicago. In the summer of 2007 she headed to San Francisco to heighten her chances of meeting a dolphin, and ended up following cargo ships up to her current hometown. In addition to painting the adventures of her eponymous character, Ninjagrl volunteers at the Seattle Aquarium. Good Intentions was on exhibit from October 22 through November 15, 2010.